As announced through the 2018 RFP for CoC Funding, an Applicant’s Conference was held on Monday, July 9, 2018 during which an overview of both the RFP, itself, as well as the actual funding application was offered. If you are interested in applying for funding in this competition round, please take a look at this powerpoint deck for helpful guidance. In addition, you may always contact the Department of Planning, Housing & Community Development for assistance by either email (at Jennifer.Clarke@newbedford-ma.gov) or by phone at 508.979.1500. Deadline for applications in this competition is July 20, 2018 at 12 noon. See the RFP for details. This year’s Continuum of Care (CoC) funding competition in New Bedford’s own CoC begins at the end of June and runs through the September deadline set by the U.S. Department of Housing and Urban Development (HUD). Check out the entire Notice of Funding Availability (NOFA) CoC Competition Timeline.2018. 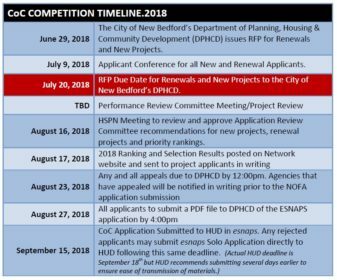 The City of New Bedford’s Continuum of Care [CoC] acting through the Department of Planning, Housing & Community Development issued an RFP COC 2018 for 2018 applications for funding from the U.S. Department of Housing and Urban Development [HUD] on Friday, June 29, 2018. 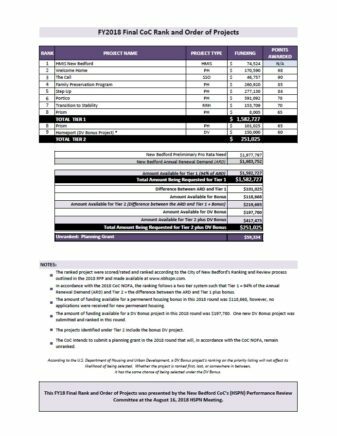 The RFP notice includes an application for both renewal projects and new projects available through bonus and DV bonus funding made available by HUD in this round. Please contact Jennifer Clarke, Deputy Director DPHCD at Jennifer.Clarke@newbedford-ma.gov with any questions.